New Signs at the Lighthouse/El Faro | ¡VidaMaz! 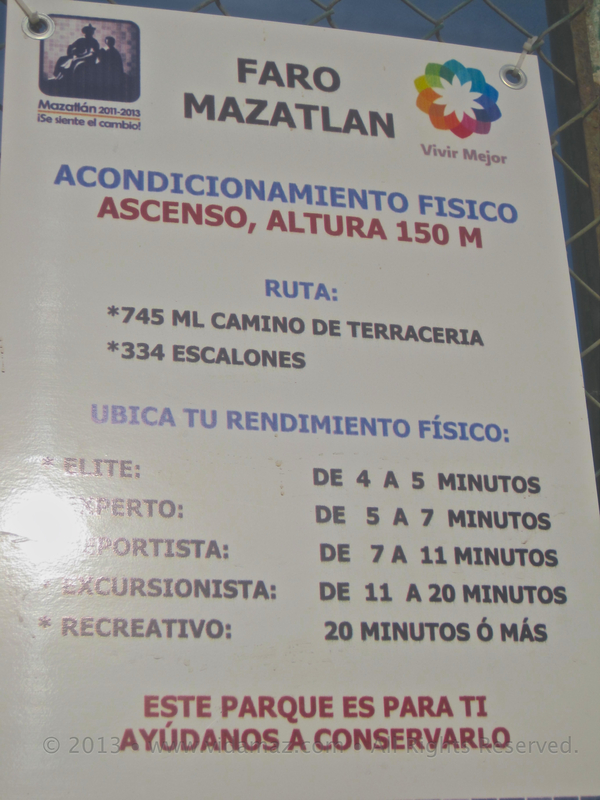 Can you run up the Mazatlán lighthouse in four minutes? The last running contest at the Faro that I know about, the winner got to the top in about six minutes. So what’s up with these new signs? I know I’m not in the greatest shape, despite climbing up twice a week for the past 18 months, but come on! The guys who work there who walk up that hill every day tell me it takes them 21 minutes on average. Of course, they lug all those water and soda bottles in their backpack as they climb, and they don’t run up. They also put a beautiful plaque in, with a few historical points on it. Trouble is, someone has planted a large plant right in front of the new plaque. Hopefully that will get moved a bit soon. Recently Irving Fregoso sent me some documents to translate from Spanish to English, saying they are planning to do a photo exhibit about the history of the Faro. What I translated was really interesting. I’ll tell you more as I hear about the exhibit. My wife and I were in Mazatlan in January and went up El Faro every day. We loved the sign at the gate and the challenge. I am 61 and made it to the top gate in 10 minutes. My wife is 55 and did it in 8 minutes. That is terrific. Congratulations. So how would you “rate” yourselves” according to either of the scales?